Journeying from Ayr, a ruined castle on the seashore is seen as you approach Glenside Station, and that is the original defensive home of the Kennedys. Domestic life in Ayrshire in those wild times was only to be expressed in terms of castle building. Even as late as 1800 an up-to-date battery of guns was installed in the grounds of Culzean, a move suggested by the exploits of that hero, or pirate, of the last American War, Paul Jones. In the castle the collection of guns, pistols and armour is of the most varied and interesting description. A gold inlaid, double-barrel flint-lock pistol engraved with the Kennedy arms, and some valuable swords similarly inlaid, may be mentioned, one of which is a Solingen sword, “1331. Pro Rege et Regno,” inlaid in gold with a heart. The field-piece illustrated is also remarkable. 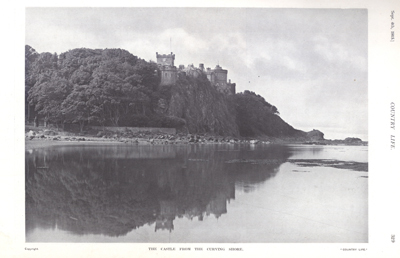 Culzean castle from the curving shore. The grandson Gilbert de Kennedy, first Lord Kennedy, was in 1466 one of the six Regents of Scotland during the minority of James III. From the numerous lands acquired, and the charters in his favour, he had become a personage of great power and influence. David, the third Lord Kennedy, was created Earl of Cassillis in 1510, and fell at the field of Flodden in September, 1513. Gilbert, the second Earl, met with no better fate, for he was slain in December, 1527, when attempting to rescue James V from the Earl of Angus. This murder of Earl Cassillis was the cause of numerous feuds between the Kennedies and Campbells. The third Earl Gilbert, the most distinguished of the early Earls of Cassillis, succeeded in 1527, when he was only thirteen. Educated by the famous George Buchanan, with whom he also made a tour abroad, he returned home in May, 1537. In November, 1542, he was taken prisoner at the defeat at Solway, and being placed in the charge of Cranmer became of the reformed religion, for which his education by George Buchanan had also prepared him. He was in London in 1545 about the marriage contemplated between Mary and Edward, and was given a pension by Henry VIII. Eventually he left the English party and went to France in 1550. In 1554, as High Treasurer of Scotland, he took part in the early opening glories of Mary Stewart’s tragic career. Deputed as one of those peers to be present at her marriage with the Dauphin of France, he witnessed that ceremony of great pomp, so soon to be overclouded. By resisting the claim for the Crown Matrimonial the Scottish Deputies caused so grievous an offence to the French Court that in its mephitic atmosphere rumours of poisoning easily spread from the coincident deaths that followed. Three died in one night at Dieppe on November 28th, 1558, of whom Earl Cassillis was one. He left two sons and three daughters. The second son, Sir Thomas of Culzean, who was knighted at the Coronation of James VI, was assassinated in 1605 by Kennedy of Drummurchie. Gilbert, the eldest, succeeded as fourth Earl and died in 1576. John, his son, fifth Earl, was Lord Treasurer of Scotland, and, dying in 1615 without issue, was followed by his nephew. In 1759 on the death, without a son, of the eighth Earl, a conflict arose for the estates and title of the Earl of Cassillis, between William Earl of March and Sir Thomas Kennedy, Bart., of Culzean, the heir male. The case was decided in 1762 by the House of Lords in favour of the latter, and he became the ninth Earl. Dying unmarried in November, 1775, he was succeeded by his brother David, who also died unmarried in December, 1792. These are the two bachelors to whom we owe Robert Adams eighteenth century Castle at Culzean. It will be noted that the owner’s death followed close upon that of the architect, only about nine months later in the same year.  That branch being extinct, the line was continued by the descendants of the Hon. Thomas Kennedy, second son of the third Earl, passing to Archibald Kennedy, eleventh Earl of Cassillis. He was a Captain in the Royal Navy and a distinguished officer. 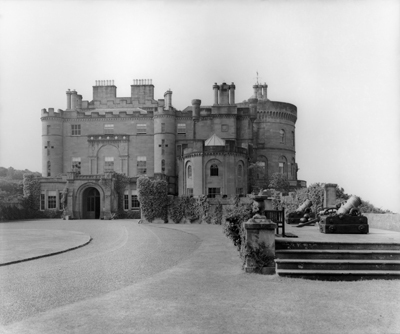 The entrance front of Culzean castle. A fine piece of plate presented by the merchants of Lisbon commemorates an action off the Portuguese coasts in which he greatly distinguished himself. It was fought on April 4th, 1760, between two English and two French men-of-war. The combined English guns were 40 to 72 of the French, and the men 300 to 500. The portraits of the gallant Captain and his wife hang in the present dining-room. The Captain’s son, Archibald Kennedy, born in 1770, succeeded in 1794 and became the first Marquess. He died in 1846. He lost his son, known as “the Sporting Lord Kennedy,” in 1832, so that it was a grandson who became the second Marquess, Knight of the Thistle, and Lord Lieutenant of Ayrshire. He was born in 1816, died in 1870, and was the father of the present holder of the title. The present owner’s life-long interest in yachting is shown by a trophy of the year 1877, commemorating the long series of successes of the Bloodhound, a cutter, which remains in service and is still successful. The Marquess is a member of the Institute of Naval Architects, established in David Garrick’s old house in the Adelphi, and chairman of the Ailsa Shipbuilding Company at Troon and Ayr, of which he was one of the founders. In the armoury, formed by the present owner by uniting the original hall and the buffet room, is a model of a Revenue lugger of 1775, known as the “Alarm.” This agent of the Exchequer found plenty of occupation in attempting to tax the incomes to be obtained in those easygoing days by extensive smuggling. The Kennedys in Ayrshire were to be found in everything. “They rode with o’er many spears,” as the old saying was, ever to be left out. Except Ye court a Kennedy. It was by a document proving headship of the Kennedy clan that the lawsuit already referred to was won, because the essential point of the male heirship was so determined. 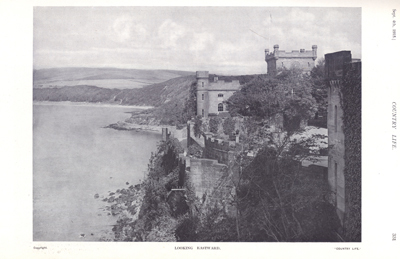 Family tradition gives 1777 as the date of the building of the eighteenth century castle of Culzean around its nucleus of an older keep or square tower of the traditional Scottish type. A ” Description of Carrick,” written by Mr. William Abercrummie, Episcopal Minister at Maybole about 1696, gives an interesting account of the earlier Culzean : All the houses of the Gentry of this country are seated both pleasantly and commodiously, being either built upon the principal rivers, and the lesser waters that feed them, or upon the sea coast. Of those upon the sea coast ‘The Cove’ is the Lairds of Colain’s Mansion House, standing upon a rock above the sea flanked on the south with very pretty gardens and orchards, adorned with excellent terraces and the walls loaded with peaches, apricots, cherries and other fruit : and these gardens are weII sheltered from the North and East winds, and lie so open to the south, that the fruits and herbage are more early than any other place in Carrick…Upon the coast are to be the old ruins, the ancient castle of Turnberry, upon the north-west point of that rocky angle that turns about towards Girwan, and is perhaps the place called by Ptolomy Perigonium : of a Greek origination, importing round the corner, and suiting the English designation of Turnberry : and that it cannot be Bargeny as some imagine the very situation of that castle and the recentness of it will abundantly show.” The writer also describes Dalquharran Castle, which belonged to Thomas Kennedy at the time (1782-90), when Robert Adam was making alterations simultaneously with the more important works at Culzean. 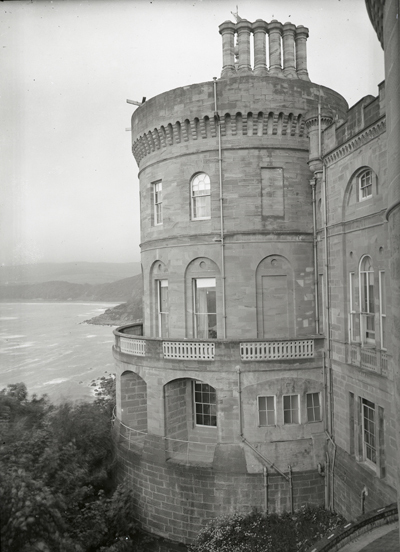 The great round tower of Culzean Castle. The present terraces on the south side would very likely represent the earlier fortifications of which the date is not known. They make charming gardens diversified by castellated structures mainly of the eighteenth century. The new approach made at that time, crosses the glen in a long series of arches, picturesquely planned and designed by Robert Adam in March, 1780, as his drawings, still preserved in the Soane Museum, show. The approach curves round and is marked by an archway with bastion supports, built as a ruin, in accordance with eighteenth century sentiment. The court in front of the entrance, situated at one end of the main oblong block of the house, is roughly oval. It has an interesting archway with a coat of arms surmounted by the family crest of a dolphin, to which the designer has, without regard to heraldry, added a boy rider. The stable block faces the main entrance and is an interesting instance of “the castle style ” as understood by Robert Adam. The tower over the archway leading into its quadrangle forms a feature in many picturesque views. In our next article we shall show that, however warlike by tradition and desire the exterior of this eighteenth century castle might be made, the interior reveals only the refinement of that age, and of Robert Adam’s style. If you are interested in additional photographs of this property, please contact the Country Life Picture Library.